Listening to Mark Zuckerberg being raked over the coals about personal information sharing on Facebook has got me thinking about this whole social media thing. I’m not all that concerned or surprised that they keep track of my buying habits, and along with Microsoft show me endless Portuguese home rentals, now that I have investigated the subject once. A little creepy at first, but that’s how they make their money to provide a free service, and what’s the harm. Advertising is advertising and maybe you will see something you like. It’s another thing to find out that they may be trying to assess, and record my medical history, if that’s true; and I refuse to give them my phone number in spite of their encouragement that it will make my account “safer”. I try not to give to much information that could be used to assume my identity and, “everybody’s fear”, drain my bank account, but I am overall (perhaps naively) fairly comfortable with letting people get to know me a bit better online. What’s the point, otherwise. I guess it’s like when you are talking to people at a party. You can either try to have an actual conversation, finding out something about the other person, and giving an opinion or something of yourself; or you can blather on about your last vacation or the weather, and essentially say nothing. Which is the more interesting evening? I belong to some antique and art groups and amongst the “look what I bought” posts, which, don’t get me wrong, are understandable and fine, I look forward to the occasional post which provides insight, or information, or excitement. There’s always a few. Perhaps less and less, or is that just me? For instance, It was great to look at the photographs of all the beautiful and rare things that turned up at Bowmanville this past Good Friday. But it was a distant second to actually being there, and able to see the show first hand. And that’s the point that we must not forget. Life looking at the screen is not actual life. You can’t touch it. You can’t really experience it’s actual presence. You are looking at a group of pixels. There is no actual interaction. It’s not real. It’s just a representation. O.k. so mobility issues, transportation problems, busy schedules etc. aside, you can argue that the main reason more and more people sit at home living their life online, rather than getting out and experiencing things first hand, is a basic laziness and disconnect brought on by the endless hours of scanning bits and pieces of entertainment and information; always on the surface, always moving on, which is the essence of web surfing. I just drank a cup of coffee from this cup. As I sat and sipped I thought again of how much pleasure drinking this delicious hot beverage from this cup brings me. I like the way that the sides of the cup is a complimentary shade and form to the crema. I like the weight and shape. I like that it was hand thrown and I can feel the grooves that the potter’s finger’s made while forming it on the wheel. It’s marked “Woodside Potteries” Made in Canada, which is fine because it means it is made by an artisan and not mass produced, but in the end aside from the aforementioned aesthetics, I like it because it reminds me of the day I bought it. It was on a beautiful, sunny Sunday in late May last year when while visiting our daughter and her husband in Toronto we noticed an ad in the local paper for a neighborhood yard sale over a series of blocks nearby, just off the Danforth. We knew that in terms of scoring a treasure we were too late by hours as it pushing ten o’clock and the pickers would have been through about eight; but we also knew that there is a nice, little breakfast place that we like on the Danforth that would be a great place to end up at for a late brunch. Also, when your tastes run to eccentric, as mine do, something I may like could be passed on by almost everyone. To be honest, I didn’t care if I found anything or not. I just enjoyed being out interacting with friendly strangers with my family on a sunny morning with the promise a big breakfast on the horizon. Plus, it is good for me to walk, and going up and down streets looking at stuff is a good way to walk without noticing it so much. We parked and walked a bit and about four places in we encountered an interesting array of stuff brought out from a very eccentric looking house by some pretty bizarre looking people. I got a little excited when I saw an old typewriter, several old photographs and then set my eyes on a classic 1940’s waterfall vanity dressing table marked $25. Hmmm. Well I could theoretically make $100 by going back, getting the car, and ultimately dragging it to our booth at the Waterford Antique Market. But it needed a bit of work, and it’s really not my thing. Plus it would put me out of sink with the rest of my party, and at this point in my career, if you can still call it that, I only buy things that I would buy for myself. Things that interest me, or that I recognize contain an energy of originality. It was a pretty little vanity at a great price, but I walked on. Several blocks later, we had a bought a few books and a couple of those plaster fruit that they used to give out at the fairs. I have a soft spot for those. We once had a large white wall in the kitchen covered with them and it was big fun, but you know, it’s not the type of purchase that you brag to your friends about. We were approaching the restaurant and there was just one row of houses left when I noticed this cup on a table in front of a fairly upscale (gentrified) bungalow. Very nice woman who seemed so trustworthy and fun that my daughter bought a couple of used puzzles from her. Now that’s trust. Anyway, chat, chat, chat, and then “ I notice you are checking out my coffee mug. Five bucks if you can use it”. 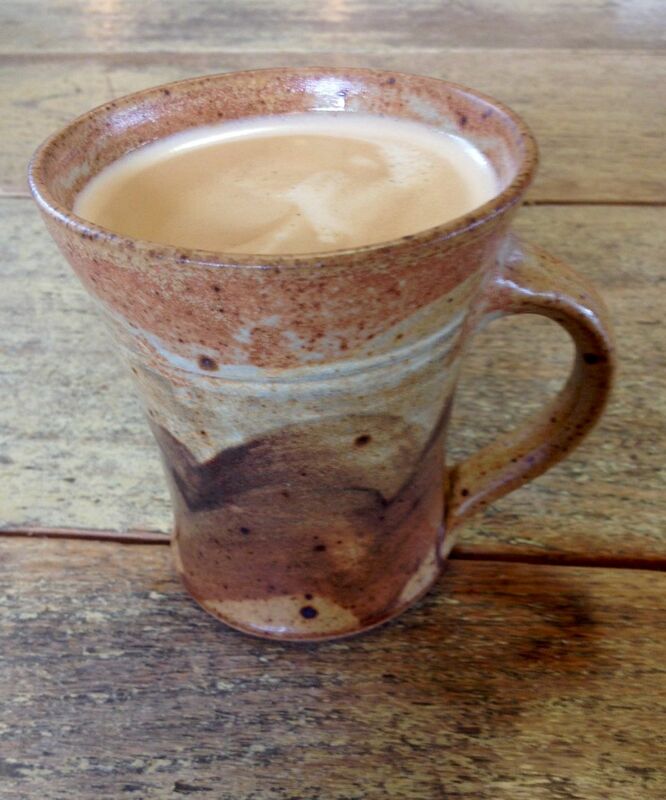 You have to drink coffee out of something and for coffee mugs we look for handmade Canadian pottery so it qualified. “I’ll take it”. It was later that it became my favourite. The breakfast that day was delicious. It has to do with the style and weight and the way it keeps my coffee warm, but my affection has most to do with the memories it brings forth of that day; as Lou Reed would say “ a perfect day”. This is why we must make the effort to get up, get out, and do something. Look around. Interact with your fellow humans. Have a “perfect day” and perhaps find something to bring home to remember the day by. You can’t order that from Amazon.